Justice Sonia Sotomayor has temporarily blocked the Obama administration from forcing the Little Sisters of the Poor, and other Roman Catholic nonprofit groups, to provide health insurance coverage for birth control. They and other Catholic organizations use a health-plan known as the Christian Brothers Employee Benefit Trust. The Obama regime mandate was to go into effect on New Year's Day The administration now has until Friday to respond to the Supreme Court. 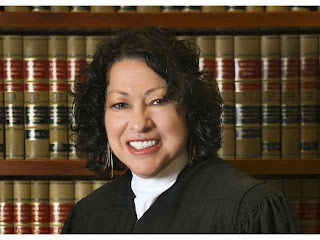 We'd like to think that some stirring of right reason, a Catholic conscience formed by family or the Sisters of Charity at Spellman High School, may have played a role in Madam Justice Sotomayor's deliberations. It is encouraging to see one of Obama's own appointees standing up for the "one eternal and unchangeable law." We hope, too, that this intervention will encourage massive civil disobedience to the regime's unprecedented assault on freedom of conscience. The groups’ lawsuit is one of many challenging the federal requirement for contraceptive coverage, but a decision on the merits of the case by the full Supreme Court could have broader implications. We hope that the Court will ultimately uphold the rights of conscience and religious liberty for all Americans and not merely those Church-affiliated groups bringing these lawsuits.